We extend our heartfelt thanks to the Canadian Tire stores at Hillside, View Royal, Royal Oak, and the Gordon Head automotive centre for their 15th annual Fix-A-Heart campaign. From November 24 to December 24, 2017, these stores raised more than $58,100 through at-the-till donations! 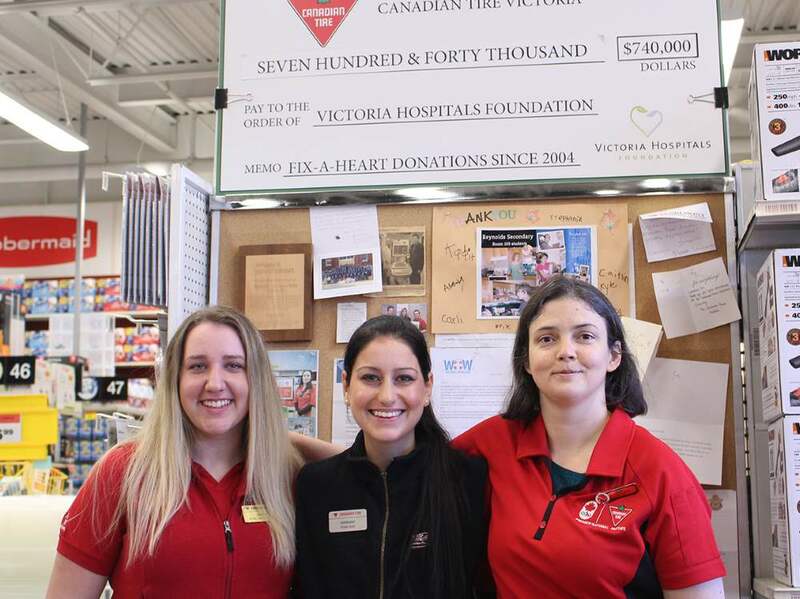 Since 2003, Canadian Tire has cumulatively raised more than $798,900 for Heart Health at Royal Jubilee Hospital! To the owners, staff, and shoppers of Canadian Tire, we are grateful. Most people know Canadian Tire as the place to go when something needs to be fixed. Fifteen years ago, Langford store dealer Peter Spillette decided that since they were already in the business of fixing things, why not take the opportunity to help fix hearts too? Peter passed away from cancer in 2008, but by then an incredible legacy had begun to take shape. Just five years after Fix-A-Heart was born, it had already raised $300,000 for cardiac care at Royal Jubilee Hospital. Dave Ullathorne, former owner of the Douglas Street store, took the reins to continue the effort to improve cardiac care. Although now retired, he can be proud that today, Fix-A-Heart has raised more than $798,900. Since 2003 the campaign has purchased advanced equipment such as specialized beds for cardiac patients, diagnostic treadmills, defibrillators and other sophisticated equipment that directly benefits patients and enables doctors and nurses to offer state-of-the-art care. We are so grateful to have so many people in the community working towards a common goal. Thank you!